There are four basic ways to deal with risk. We can avoid it — we can avoid the risk of riding motorcycles, for instance, by not riding motorcycles. This isn't an option for LTC risks. We can mitigate the risk, for instance, by wearing a helmet when we ride a motorcycle. I'm not sure there's an effective way to mitigate LTC risk. We can insure risks, if insurance is available and affordable, by paying an insurer to assume the risk for us. When something bad happens to 38% of a class of persons who might purchase insurance, though, insurance will rarely be affordable, and that's the case with LTC insurance. It is expensive and doesn't work well. Lastly, we can accept the risk. That can mean we believe we can pay for the risk if it is incurred (we self-insure), or it can mean that we don't believe we can pay for it but have no reasonable alternatives. The first is a financial decision and the second is a fact of life. The best way to deal with long term care (LTC) risk depends in large part on the retiree's wealth. For retirees without much wealth, LTC insurance will be unaffordable and the only realistic option will be to accept the risk and go the Medicaid route. For wealthy retirees, those with perhaps a million dollars or more (two million for a couple), accepting the risk by self-insuring may be a better option than buying expensive insurance. Wealthy retires also have the ability to buy insurance, of course. The difficulty is for retirees who fall in between these levels of wealth. The in-betweeners must decide how much they value secure annual income versus how badly they wish to avoid the possibility of spending all their wealth at the end of life. Retirees may change their minds as they age and conditions change. The question you have to answer is how much of your wealth are you willing to dedicate at this time to support normal spending and how much to protect end-of-life wealth? One option for the retiree is to reduce "normal" spending in order to purchase LTC insurance. In that case, LTC premiums can be considered non-discretionary spending and included in the portion of the spending plan that covers those expenses (the floor). The downside of this approach, in my opinion, is that the LTC insurance industry is still trying to figure out its risks. Some carriers have stopped offering the insurance and some have dramatically raised premiums. Retirees who can't pay for premium increases may have to let their policies lapse and premiums they previously paid will have been paid for naught. They might find acceptable ways to decrease their coverage to make the new cost affordable. An upside of LTC insurance is that it can pay expenses far greater than most retirees can pay from savings. Saving is another approach some retirees consider in anticipation of experiencing LTC costs. This is a difficult proposition, akin to saving to replace a destroyed house instead of purchasing homeowners insurance. 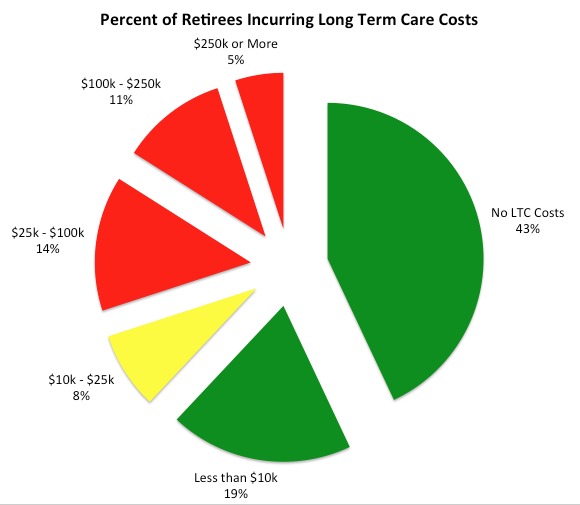 The LTC costs may present themselves long before the retiree has saved enough to cover them. If the amount to be saved annually is roughly the same as insurance premiums, the latter would better cover large expenses. It will be nearly impossible for most retirees to save enough to cover the top 16% of expenses in the chart above. Another benefit of LTC insurance is that it will pay those expenses the day after you buy it, while saving for the expense assumes that you will have time to save. Exacerbating this problem of inadequate time to save is the fact that younger LTC patients tend to have longer and more expensive nursing home stays. One study showed that for every year of age when entering a nursing home after age 85, the average length of stay declines about 35 days, and with it the cost. Your potential LTC expenses are greatest when your savings will be smallest. If you're going to try the savings approach, I'd recommend a separate portfolio for LTC liabilities, for reasons I explained in The Thing That's Missing. Be aware that you might reduce your retirement spending in order to save for LTC expenses and never incur catastrophic expenses. Conversely, you might reduce retirement spending and save a large but inadequate amount of money to pay for long term care. If it's inadequate and you eventually rely on Medicaid, you will be forced to spend that savings on your care before Medicaid will begin to cover costs, in which case you would have been better off spending that money throughout retirement. Another alternative is to buy a longevity annuity that begins paying at age 80 to 85. Forbes magazine's William Baldwin believes this approach is better than LTC insurance in three ways. First, with the annuity, you can spend the money any way you want, not just for LTC-covered expenses. Second, annuity providers can't change the terms after you buy a policy, like LTC insurers can and do. And thirdly, you won't have to prove to an annuity provider that you're owed the payments. On the other hand, you wouldn't be covered if your LTC expenses occurred before you're in your eighties. Since a third of LTC patients need this care even before age 65, there is a good chance that you will need the money before a longevity annuity would pay. Most retirees won't be able to afford long term care insurance as it is currently structured. If you can afford the premiums, you need to understand that you have two quite different goals, which most people will value differently, competing for your resources, maximizing annual spending and protecting end-of-life wealth. The challenge is deciding how much of your assets you wish to dedicate to each goal. To tie this back to retirement income strategies, any strategy except Life Annuities would probably have some funds left in the spending portfolio to help pay long term care expenses. Which of the other strategies would do this best depends on future market returns and interest rates, which is to say it's unpredictable. I wish I had a happier solution to long term care risk, but unless and until LTC insurance becomes much more affordable, I don't think there is one. "I wish I had a happier solution to long term care risk, but unless and until LTC insurance becomes much more affordable, I don't think there is one." I wish you had one, too. If you did, I'd be with my wife traveling the world for a couple of years, spending the money that we have saved in order to self-insure our LTC. Fortunately (I guess), we are less desirous of that 2-yr trip than we are of reducing the fear of possibly living our last years in the ignominy of a Medicare-supported LTC situation. So, the decision is relatively simple. And, we're almost to the point where we can do both, thanks to the market and to the assiduous rebalancing of our stock/bond portfolios we've engaged in over the past couple of years. We're in a unique position in that regard, however, as a childless (by choice) couple with no need to leave anyone a legacy. Thanks for a very nice post, btw. It was very thoughtful, and much appreciated. You filled in some gaps in our thinking for us. Ditto on this thoughtful informative post. I was able to procure a cash-benefit LTC policy with an inflation rider to cover approximately 2/5 of charges for a local good care facility . That is all the policy I can afford, but the benefit will double in 14 years, and it pays out regardless of where I am when I need it i.e. at home, assisted living, etc. Moreover, I can use it to pay any home health aide, including a relative. Now, you might ask what good is a 2/5ths benefit; well, my income sources (SS, RMDs, annuity) will just about make up the other 3/5ths, and if I need more, then I start dipping into my IRA balances. But our state has a partnership in place whereby I'd be able to retain assets in the amount of the total lifetime benefit if I needed to apply for Medicaid. This is very attractive to me, as I hope to leave at least a small legacy for my children. I am pleased to hear that LTC insurance helped your father. I have heard several similar stories from Boomers about their parents. The one caution I would offer is that the LTC policy you can buy today might be quite different than the one your father bought. Insurers initially under-priced their policies and, while that may have benefited out parents, the same deals are probably much, much harder to find nowadays. Just shop with caution. I started paying for LTC insurance for my wife and myself at age 60 and we are now 62. One thing that I considered that you have not mentioned is that the cost of caregiving before entering a nursing home is typically placed on family members. There can be a long period where assisted living is needed, and the burden of providing this may be significant. Many families reduce costs by providing care themselves, or feel guilty if they can’t provide the care that is needed. True, the cash that we spend on the insurance could be invested, and cover some or maybe all of the potential costs of providing long-term assisted living and nursing care. If long term care is not needed, we could potentially leave a larger legacy to our children. On the other hand, if significant LTC is needed we could be leaving them a legacy of costs, worry, and guilt that we have the ability to avoid. There is also a selfish aspect of my thinking. If I need care, I don’t want my wife to scrimp. There should be no reservations about using the insurance coverage, as opposed to spending down assets. I am also not well equipped to provide all the care for my wife, if say, she has a stroke and can’t take care of herself. 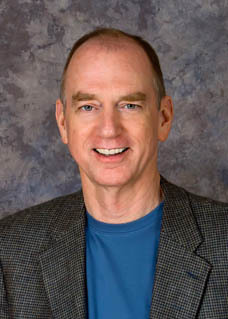 In terms of wealth, we are in the middle, and I believe the insurance can be of considerable value if needed. I don’t consider the payments wasted if they are never used, like somehow I am spending our kids possible legacy on something that is a bad investment or self-indulgent. Instead, I consider the insurance a gift to my spouse and kids. Your thoughts are greatly appreciated. I don't think there's a great answer to this one financially, so it's probably just the decision that you can feel best about. LTC insurance doesn't work well and this isn't a problem that you can "out-save".